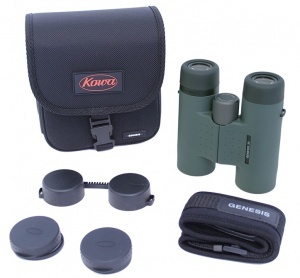 The Kowa Genesis Prominar XD 33 10x33 binoculars are amongst the newest Kowa binoculars to use the PROMINAR brand name, utilizing four XD lenses. These high performance binoculars use the technology of the TSN-880/770 series spotting scopes and pair XD lenses with convex lenses made of glass with special dispersion properties to reduce chromatic aberration to a further degree. This advanced technology creates a bright image with high contrast and remarkable color reproduction that can not be duplicated by a normal achromatic lens. 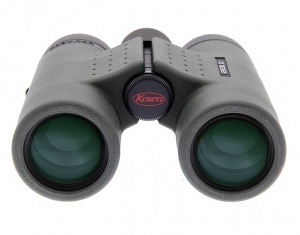 The XD33 Series are the 'WIDE-ANGLED binoculars' and comply with the ISO 14132 standard. The prism is phase-coated to ensure sharp images and outstanding contrast. New coatings provide superior image brightness and precise color reproduction for improved viewing pleasure. Ideal for observation of plants, insects, and other objects within close range. Waterproof & filled with Dry Nitrogen Gas. *Not intended for underwater use. The diopter control is equipped with a locking mechanism that keeps the diopter from accidentally being changed. 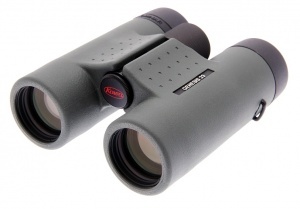 Kowa's roof prism binoculars use the Schmidt-Pechan prism. One surface of the Pechan prism does not provide total reflection, so we have applied a highly reflective multi-coating called C coating. This allows for a higher reflectivity than with silver or optically enhanced aluminum, offering a reflectance of 99% or higher across the entire visible spectrum (400 to 700 nm). Not only does this provide bright and sharp images, but accurate color reproduction is also achieved. Furthermore, the roof prism of the Schmidt prism is phase coated to prevent the loss of contrast and image resolution.